Region Five Executive Officer, Ovid Morrison. 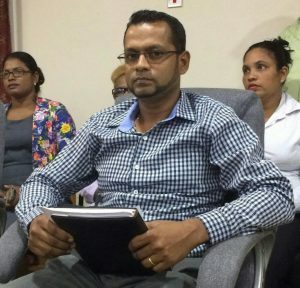 It’s been six months since a full Region 5 Regional Democratic Council (Mahaica-West Berbice) meeting has been held, with the two top regional officials at odds over the need for an apology and whether the disruptions have had a toll on project execution. This is due to an ongoing feud between the Regional Chairman Vickchand Ramphal and Regional Executive Officer (REO) Ovid Morrison. The standoff commenced several months ago when an issue was raised by A Partnership for National Unity/Alliance For Change (APNU/AFC) councilor at a sitting of the monthly meeting in March, 2017. The councilor, Abel Seeteram, had reported to the council that a machine was being used to clear a private plot of land in the Bath Settlement area. It was reported that the REO had told the Regional Chairman that he had conducted his own investigations and had presented his findings. However, Ramphal requested that another investigation be conducted with both sides of the House (council) present. That request was seen as a sign of disrespect to the REO who voiced his opinion and demanded an apology. 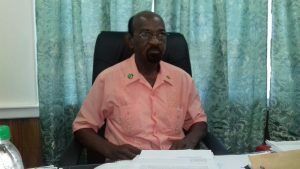 The chairman refused and the REO left the meeting with the APNU/ AFC councilors following suit. On Thursday, the action was repeated for the sixth time with the REO and the councilors walking out and demanding that the chairman apologise for his actions. According to the chairman, those disruptions have seriously affected the development of the agro-based Region resulting in several projects not being executed because the REO refuses to cooperate with the chairman. While there are six APNU/AFC Councillors and 10 People’s Progressive Party Civic (PPPC) councillors on the decision-making body, two from each side were absent at Thursday’s aborted sitting. Already, the APNU+AFC side is short of two councillors because one seat was never filled since the May 2015 elections and Carol Joseph resigned at the height of her controversial access to pethidine, a prescription pain killer. Regional Chairman Ramphal, speaking with Demerara Waves Online News, justified his call for another investigation to be conducted. He stated that protocol required both sides of the house to conduct their investigations and come to a proper conclusion. “It was required for both sides of the house to do an investigation but that was not done. Just one councilor and the REO went to the area to assess the issue and that should not have been”,” he said. Ramphal stressed that the development in the region is stalled because of the repeated walk-outs. He noted that the REO is needed to execute the developmental projects needed in the region but to date, that cannot be done because the REO and regional councilors refuse to put grievance aside and cooperate. “We are unable to deliever the rightful service to the people of Region 5 because the REO is not present at meetings to address these issues. He is the clerk of the region and the one that has to execute these projects but because he is not there, they are being denied services they require”,” he said. When asked if an public apology would be issued to the REO, the chairman noted that his actions were justified. Regional Executive Officer Morrison says that all he requires is an apology from the chairman for normalcy to be returned. He stated that on the day when the report was presented to the council and the Regional Chairman, it was presented with evidence. He said that the chairman had no reason to call for a second investigation while accurate findings were presented to him. “Myself and the councilor visited the area and confirmed that the machine was being misused. So when we presented the report to the chairman, I was shocked that he requested another investigation to be done”. 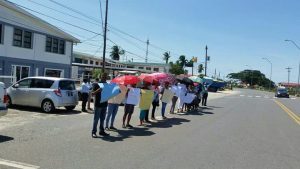 PPPP councilors held a small picketing exercise outside of the Region 5 Regional Democratic Office calling on the Region Five Executive Officer, Ovid Morrison to work with the Regional Chairman. Morrison noted that the Regional Chairman, in the presence of other regional councilors, ‘insulted his integrity and his authority” and still has not issued an apology. He highlighted that after the first walk out, the Chairman reported that he would be conducting the investigations into the allegations and the findings would be presented to council. However, the chairman after waiting for three months visited the area and still has not provided a report to council. “How is it that the Regional Chairman can sit and and let that much corruption happen right in front of him and not address it? He refused to visit the area because he knew our findings were accurate and still he cannot produce the findings he made when he visited the area”. Further, the REO refuted reports made that development has been stalled in the region. Morrison relayed that the region successfully completed the list of developmental projects for the year 2015 and requested that additional projects be completed with savings. Meanwhile, PPPP councilors held a small picketing exercise outside of the Region 5 Regional Democratic Office calling on the REO to work with the Regional Chairman. Central Government is responsible for the appointment of the REOs of all 10 administrative regions. Minister responsible for Local Government, Ronald Bulkan is already on record as saying that Regional Democratic Councils are obliged to execute the mandates of central government. Region Five is home to an estimated 49,723 persons.